Angry Asian Buddhist: Bon Odori This Weekend! Bon odori is a dance linked with Obon. Entire festivals and bazaars have developed around bon odori, and these Obon festivals are good opportunities for interaction between temples and local communities. 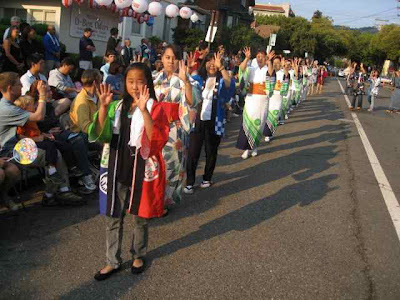 A number of Obon festivals are happening this weekend, from New York to Virginia to Chicago to Berkeley to Vancouver! If you happen to live near one of these temples, I encourage you to stop by and join in the dance and festivities. I’ve provided a list of some of this weekend’s festivals below. If you want to attend a bon odori in Hawai‘i, you are fortunate that there’s a website for this: Let’s Bon Dance! Let me know in the comments of any corrections needed with the lists above. Photo credit to the Berkeley Higashi Honganji Buddhist Temple. Thanks also to @Kyoshin, @djbuddha and Rev. Usuki for helping me find the lists of temples above.